Chor der Deutschen Oper Berlin, Orchester der Deutschen Oper Berlin / Thomas Søndergård. Deutsche Oper, Berlin, Germany. Sunday, February 19th, 2017. 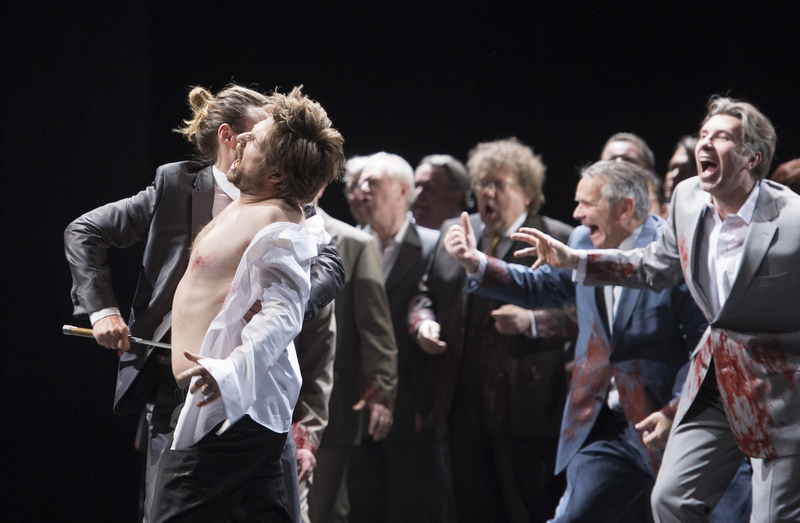 Tonight marked the premiere of 45-year-old Swiss composer Andrea Lorenzo Scartazzini’s third opera, Edward II. Written in cooperation with the librettist Thomas Jonigk, it proved to be an arresting evening in the theatre and an engaging introduction to his work. The Deutsche Oper certainly pulled out all the stops for him. In preparation they published a number of trailers on their website as well as interviews and insights with the cast and creative team. 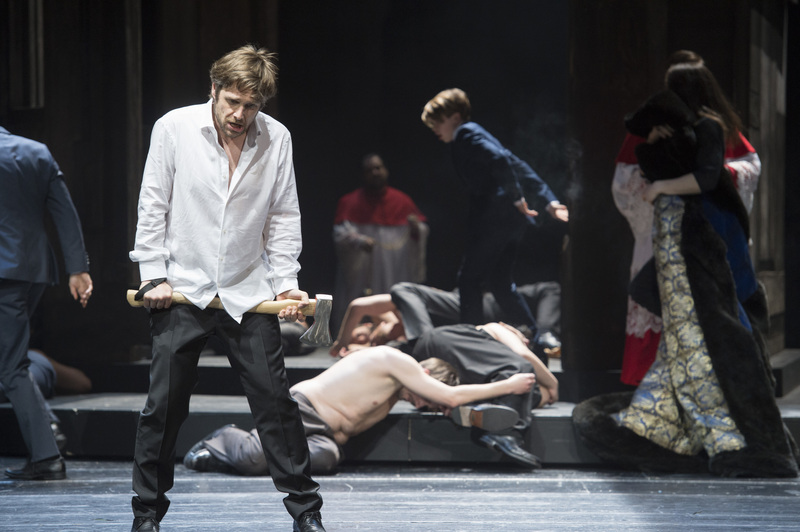 For Scartazzini, Marlowe’s Edward II was a work that he read during his own coming out and the opportunity to write an opera on this theme was clearly very important to him. What we got was not a straightforward setting of Marlowe but rather a somewhat looser combination of Marlowe, Ralph Holinsheds’ 1587 Chronicles of England, Scotland and Ireland, and the 14th Century Vita Edwardi collated in to Jonigk’s German-language libretto. What we don’t see is a conventional, linear narrative. Rather, the work is organized around three crucial points – it opens with Gaveston’s torture and murder, Gaveston’s pursuit by the crowd comes toward the mid-point, and the evening closes with Edward’s grisly end. This fragmented narrative meant that, in many ways, we didn’t really get a sense of who Edward really was until the end. What was also missing was a tenderness in his relationship with Gaveston, which we only really became aware of in that final scene. Up until that point, it felt that the characters lacked depth. It felt hard to have any sympathy for the power-hungry Queen, the mob chanting against Jews and homosexuals, or the Bishop who was rogered with a penetrating instrument by Gaveston. 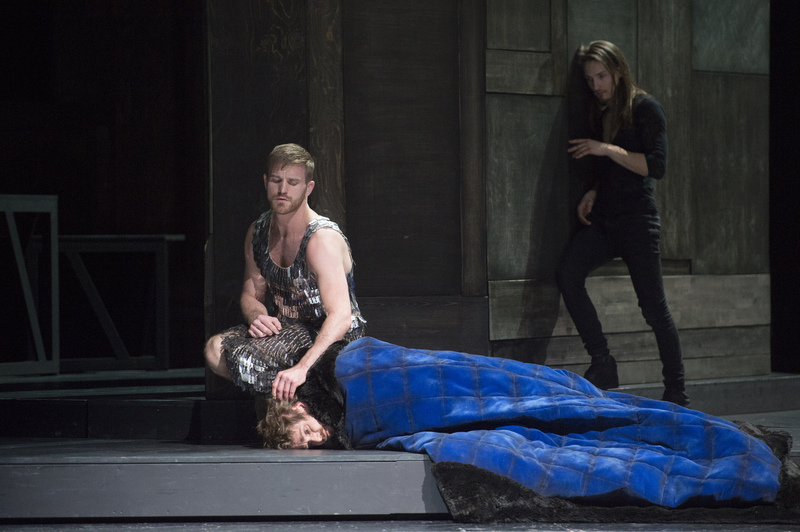 Yet as Edward faced death, the remorse and heartfelt regret exemplified by Michael Nagy’s assumption of the title role was deeply moving. Christof Loy’s staging was also marked by the events of our day. The massed crowd scenes were redolent of the anti-equal marriage protests seen in France. They also served to remind us that in Germany, a country that in these sombre days is a beacon of hope, marriage equality is still yet to arrive. Of course, Scartazzini, Jonigk and Loy are not the first to combine the ancient and the modern in a telling of the story of Edward II – the late Derek Jarman’s landmark of new queer cinema’s setting of Marlowe already combined the ancient and the modern back in the early 1990s. What we did have tonight was a fascinating piece of theatre – one that didn’t give us all of the answers but that was as complex and conflicted as Edward II himself. Agneta Eichenholz & Ben Kleiner. Photo: © Monika Rittershaus. Scartazzini’s musical language reflected the subject matter. As the evening began Scartazzini combined the instruments in the pit with electronics, making us question whether what we heard was real or perceived. His instrumental writing showed great assurance with multiple tone clusters, bluesy half-lights in the brass, and strings used like percussion with percussion used as strings, driving the melodic fragments forward. Certainly, the sheer assurance with which the Deutsche Oper chorus plucked stunningly-tuned tone clusters apparently from thin air was staggering. The border between song and speech was constantly crossed – the chorus’ writing at times reminding us of Moses und Aron in its use of sprechgesang and the principals alternating between speech and song. The vocal writing seemed to be quite singable on the whole but there were a few extreme leaps between the registers that the cast managed to execute with seemingly effortless ease. In many ways, with the big crowd scenes and individual passions this was very much a twenty-first century grand opera. The singing of the Deutsche Oper’s chorus was superlative – big, theatre-filling sound combined with unfailing accuracy and unanimity of tone. They had been prepared with outstanding attention to detail by Raymond Hughes. That staggering accuracy displayed by the chorus extended throughout the entire cast. 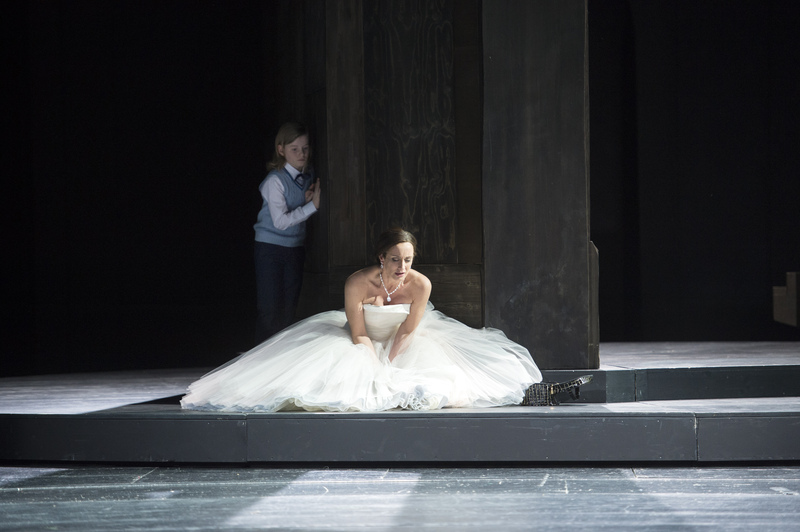 Michael Nagy gave us a magnificently assured and magnetic performance in the title role. His handsome baritone has a beauty that brought out Edward’s heartbreak at the end. There’s a heroic core to the sound that fills out nicely, especially around the middle and bottom, yet he wasn’t afraid to compromise the handsomeness of the tone to illustrate Edward’s pain. He dominated the stage whenever he appeared on it and gave us a searing performance that felt as if he was bearing his soul on stage for us. Michael Nagy. Photo: © Monika Rittershaus. Agneta Eichenholz was formidable as Isabella. Her role contained some punishingly high, sustained writing yet she dispatched it with seemingly nonchalant ease. There was never any sense at all of someone operating outside of her comfort zone and given the extreme nature of the part, she never compromised on the clarity of her diction either. Ladislav Elgr sang Gaveston with a lyric and mellifluous tenor that navigated the awkward intervals and was both seductive and petulant when he needed to be. 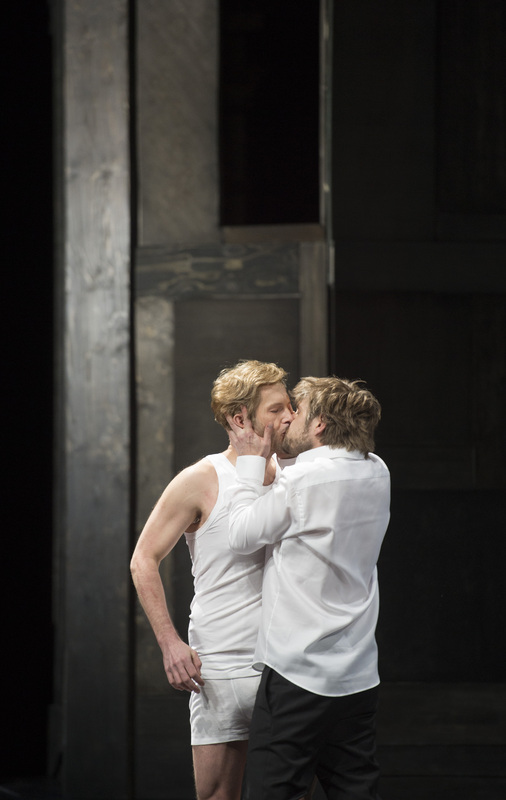 Jarrett Ott, in the role of the Angel, a mysterious figure seen only by Edward, sang with a light, peppery baritone that contrasted nicely with Nagy’s fuller tones. 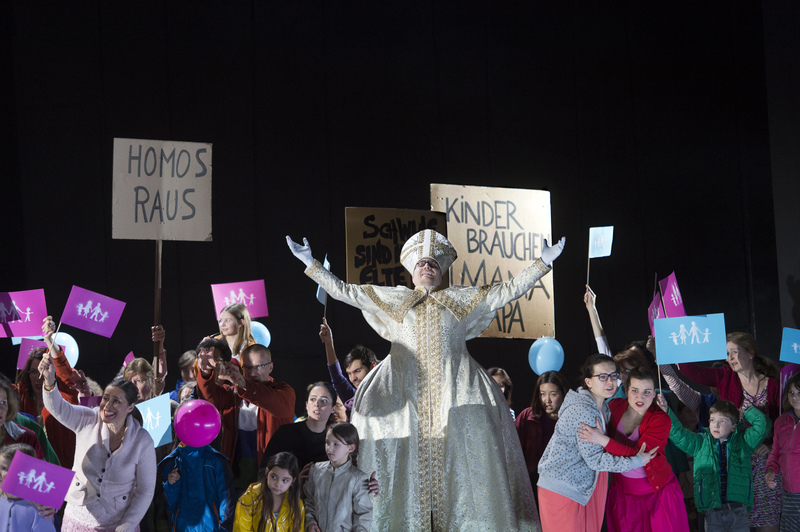 Burkhard Ulrich brought his characterful tenor to the role of the Bischof von Coventry while James Kryshak’s insinuating, almost nasal assumption of Lightborn made his presence known towards the end. I was also impressed by Andrew Harris’ Mortimer sung in a warm, complex bass of impressive depth and roundness. Markus Brück and Gideon Poppe offered some scene-stealing cameos as Bishops, tour guides and leather daddies. Ladislav Elgr & Michael Nagy. Photo: © Monika Rittershaus. Thomas Søndergård led a confident reading of a piece that in its ninety-minute length felt tight and ideally formed. The orchestra played well for him, with the strings creating a sound world that combined harmonics that seemingly floated on air with violent col legno effects. What struck me in particular was how sparsely accompanied some of the sung lines were with eerie harmonics or solo percussion accompanying the principals but at the same time Scartazzini wasn’t afraid to unleash the sheer power of the band to accompany the big crowd scenes. Michael Nagy, Chor der Deutschen Oper Berlin. Photo: © Monika Rittershaus. This was a gripping evening in the theatre, one that combined some astounding musicianship with virtuosic singing and a confidence in the handling of the large forces that inspired admiration. Ultimately, and perhaps inevitably, it feels like a fragment. It is however a fragment that I think definitely needs to be heard again and does have the potential to become a repertoire piece. We don’t always feel sympathy for the characters but what Scartazzini and Jonigk achieve is making us feel empathy for Edward as he reflects on his life and faces death. In the final tableau we see Edward prostrate on the floor, about to be penetrated by that notorious poker that ended his life, while a crowd of museum visitors walks around him. Perhaps the message is this – that individuals like Edward suffered to give us the rights that we enjoy today. We must never forget that. Reblogged this on Hugo De Pril's Blog.